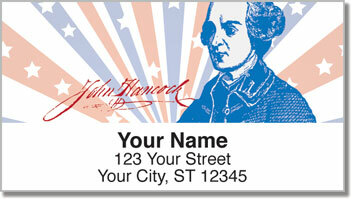 The four figures featured on this patriotic set of return address labels were extremely influential in the founding of our nation. These men were patriots, forward thinkers and innovators. You'll find two signers of the constitution including the oldest, Benjamin Franklin, and the man whose name became synonymous with the signature, John Hancock. 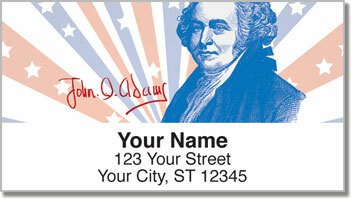 There's the second U.S. president, John Adams, and the author of the Declaration of Independence, Thomas Jefferson. 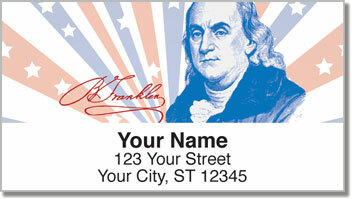 Use these labels for a finishing touch that celebrates freedom. Plus, you'll get back a little of your own free-time thanks to the convenient, self-adhesive backing. All you need to do is stick a label on every envelope. 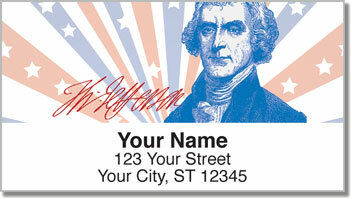 Order your very own Founding Fathers Address Labels now! Get them with matching personal checks today!